There’s a serious danger, I think, in Learning Analytics, of producing and processing ever more data in ever more exciting and attractive ways, but which aren’t connected up to making things any different for learners. This is nowhere (!) more true than in learning analytics. Analysis without action is wasted effort – which we can ill afford now. Those of us with a penchant for data, sums and code (I know, I know, but we have our uses) can get terribly excited about new sources of data and new analyses. It’s great to come up with new ways of understanding and interpreting what’s going on. But if that effort doesn’t translate in to better action – it’s pointless. On the other hand, action without analysis may be making things worse – you just don’t know. (A point sometimes lost on misinterpreters of Marx who focus only on the ‘change it’ bit. You can say many rude things about Marx – and I sometimes do – but not that he was short on quantity of analysis of capitalism.) We’re certainly going to be seeing a lot of dramatic change in universities in the coming years. If we don’t have the right evidence supporting decision-makers in that process, not only will the decisions be made in the dark, we won’t even know how wrong they are. For me, this means engaging with all the frustrations of internal systems, processes and decision-making. If I was just interested in research outputs, I could just dive in to the systems I can get access to, grab some data, do some analysis, and go. It’s much harder to arrange and endure the endless meetings, papers, persuasion, and frustration that is what happens when you try to make a substantial change to a large bureaucratic organisation like a university. But that’s where the real value and potential lie. Learning analytics starts with the learner, and their ‘data exhaust’. We need to make sure it gets back there again. NB For clarity (thanks anonymous tipster!) that last sentence is meant entirely figuratively and I am emphatically not advocating gassing students. That would be Evil and Wrong. I’m trying to make things better for them. 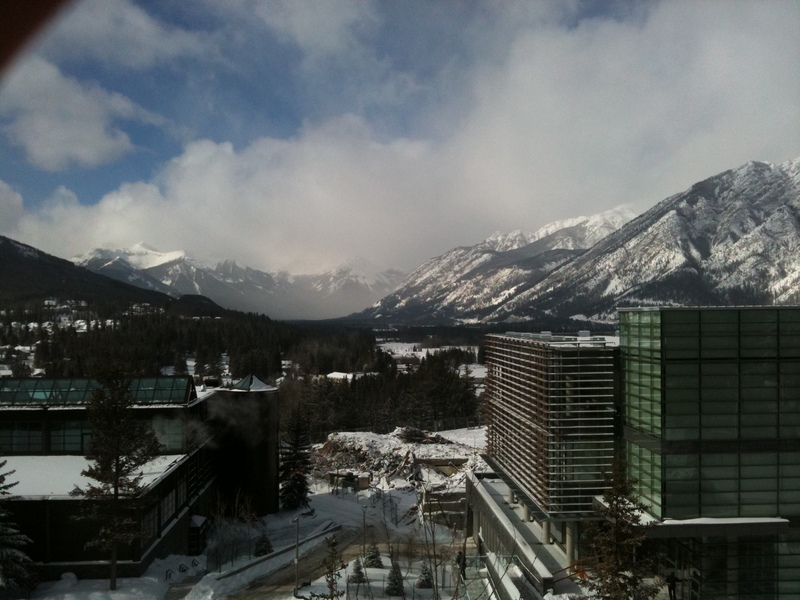 Liveblog notes from the afternoon session on Tuesday 1 March, the second full day of the Learning Analytics and Knowledge ’11 (LAK11) conference in Banff, Canada. It’s still bitterly cold, but it’s bright, sunny and clear, and the views are even more stunning than this morning. With this scenery and situation, I can understand why Banff Centre is a hub for creativity and inspiration – it is remarkable here. 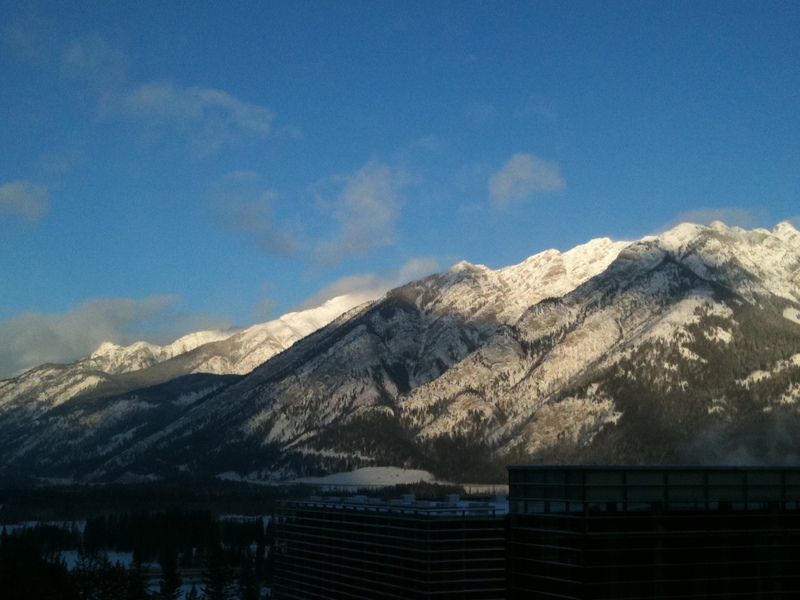 Liveblog notes from the morning session on Tuesday 1 March, the second full day of the Learning Analytics and Knowledge ’11 (LAK11) conference in Banff, Canada. It’s fearsomely cold here – about -30C this morning – but stunningly beautiful. This is a quick snap out of the window of the restaurant where we had breakfast. There are views of the Rockies all around. If I’d brought a better camera – and was a better photographer – you’d get some staggering pictures.